Asian Cabbage Salad recipe by hotline_hl at PakiRecipes.com. 1 medium size Cabbage (chopped). 1 bunch Green Onions (chopped). 2 1/2 tea spoon Sesame seeds . 1/4 cup White Vinegar . 2 table spoon Soy sauce. In a medium skillet over low heat, brown ramen noodles, sesame seeds and almonds with butter. In a small sauce pan, boil vinegar , sugar and vegetable oil for about 1 minute. Cool and add soy sauce. 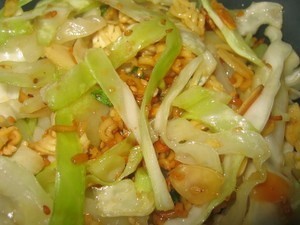 In a large bowl, mix the chopped cabbage , green onions and ramen noodle mixture.